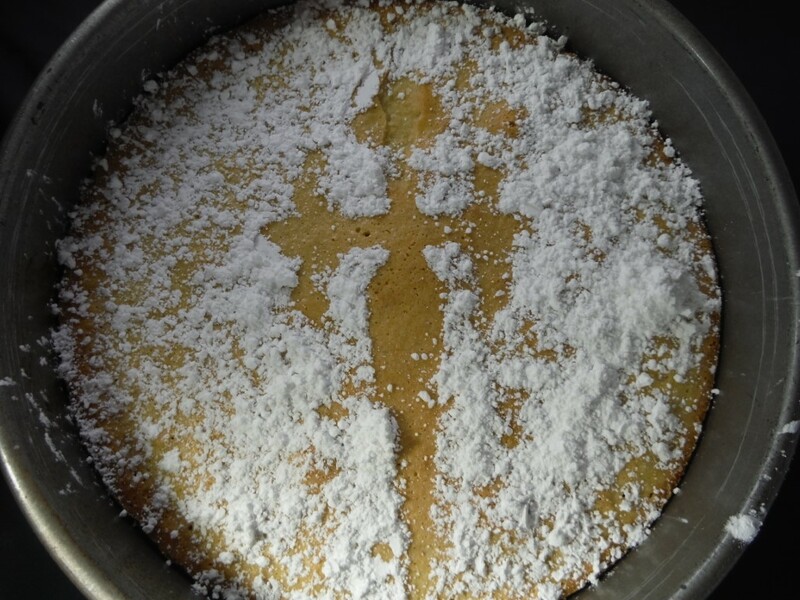 This is an adaptation of the recipe for Tarta de Santiago (Galician Almond Cake) for backpacking or canoeing. The key adaptation is using powdered eggs (I used Hoosier Hill Farm – available on Amazon) rather than fresh eggs. Otherwise, all the ingredients are dry in the base case, so this cake is very suitable for backpacking. At home, put 2 oz. of the almonds and the flour in the bowl of a food processor, and coarsely chop. Put the ingredients into a small ziplock baggie. Then put the remaining almonds (4 oz.) and ¼ cup of the sugar into the bowl of the food processor, and process until finely ground. Add the ingredients to the small ziplock baggie with the coarsely chopped almonds. Put the egg powder and the remaining ½ cup of sugar in another small ziplock baggie. Put both ziplock baggies in a gallon ziplock baggie. Note: Baking parchment at the bottom of the pan will keep this from sticking to the pan. My test batch at home was done without baking parchment and stuck to the pan.